A few weeks ago, we had the extreme pleasure of being exhibitors at RTX 2015, a weekend-long fan expo for the local Austin production company, RoosterTeeth. If you follow us on twitter and facebook (which you totally should if you don’t), then you no doubt saw all of our content from the event. We were tweeting and posting up a storm! The upswing in our content developed naturally, because we realized that we seemed to be engaging really positively with the RoosterTeeth community, so we just continued to post and post. When we’re working an event, we typically get a modest 6-12 favorites or retweets on a post. However, we were seeing some of our RTX tweets get into the 50s. This isn’t astronomical by some perspectives, but it was out of the norm for us. Moreover, traffic on our website usually dips down over the weekend, even when we work and promote our company at an event. However, we found our RTX tweets drove our web traffic unusually high. It’s definitely worth admitting that our social media activity could have spiked because the kind of people who attended RTX are social media savvy. RoosterTeeth for the most part, produces gaming-centered content for YouTube. Although they produce some animated series, several podcasts, and have recently expanded into live action shorts, I would argue that any of the gaming series on their Let’s Play channel are the studio’s bread and butter. The studio represents very talented game players who have successfully garnered a rabid, international fanbase. RoosterTeeth releases and promotes new content online only, therefore, the fans are used to being tied into the studio’s online presence. Also, because their talent is comprised mostly of twitch streamers and voice actors (people who make money by playing video games online for an audience), the RoosterTeeth stars have cultivated a strong online brand, out necessity to be successful at what they do. Even if we got a lot of web traction precisely because we were tweeting to a convention full of internet nerds (that’s a compliment), I would really like to think we were also doing a few things successfully on our end. I’m going to try and and see if I can’t nail those things down a bit, so that any other fan expo exhibitor could hope to have the same success we did. I think, by and large, the best thing we did was create a large, impressive print that we kept under wraps until a few days before the event. If you were keyed into our feed during RTX, then you saw the 6’x4’ scythe weapon our intern Jacob created especially for the expo. This took some planning, but it was worth it. 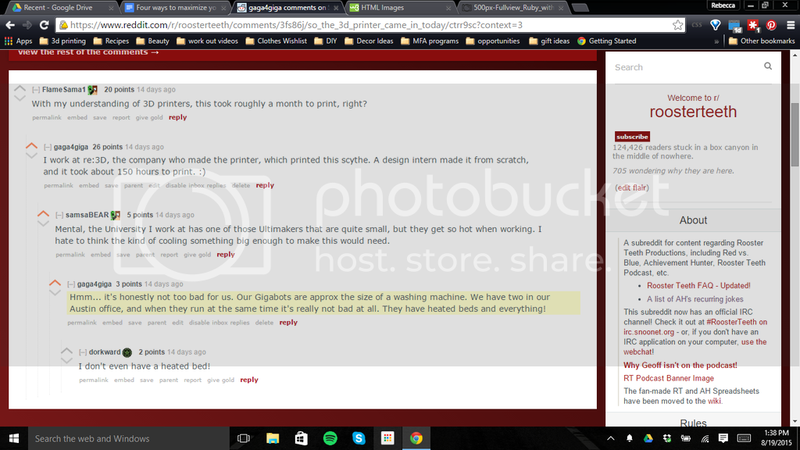 In March, as soon as I found out we’d be exhibiting at RTX in August, I started researching their most popular content, hoping there would be 3D printable prop. 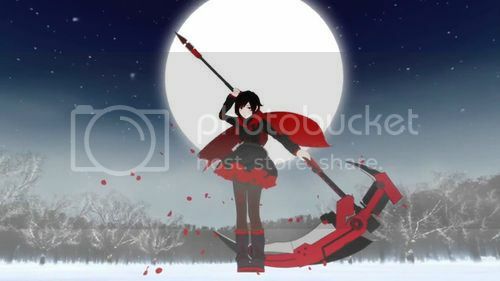 To my great delight, the RoosterTeeth original anime, RWBY, features an awesome weapon, called The Crescent Rose. This thing was going to be the perfect demo piece to show of Gigabot’s capabilities– it was huge and instantly recognizable. It would be really impressive if we could pull off making it. Luckily for me, one of the interns we hired this summer was super artistic and a big anime/cosplay fan, so I knew he’d be a great fit for this project. I drafted him as “my” design intern and asked him to design, print and post-process the Crescent Rose, all from scratch. The whole process took from June to August, basically all summer. Two days before RTX 2015, a bunch of us from re:3D visited the RoosterTeeth studios, under the guise of dropping off their Gigabot. However, I told Jacob to come with and to bring the scythe, which was nearly finished at this point. The prop was looking great, and I had a hunch the show creators and animators would absolutely love to see it. Spoiler alert– they did. This tweet from one of RWBY’s writers and voice actors got hundreds of likes, and was cross-posted to the RoosterTeeth subreddit, where it got a lot of attention. There, I was able to interact with the RoosterTeeth fans, answering questions about our printer and letting them know they could come see the scythe in person at RTX that weekend. To my great surprise, people actually did come! I had several people ask if “that was the scythe from twitter”, and I was pleased to tell them that it was! When we got a fan to show up at the booth, they were able to take a photo on their phone with the prop, which made our booth into a sort of event photobooth, and it made us a destination on the exhibit floor. As an added bonus, we could tell the fans that these boxes were available to win, all you had to do is sign up on our print giveaway sheet! We got a record number of email address that weekend– something like 500 names we could add to our monthly company newsletter. I credit this to the fact that I picked out the perfect giveaway print. The Achievement Hunter box, which I found on TinkerCAD, was small enough to be duplicated several times over the course of the event, yet large enough to be useful. A grid print of 4 boxes took 6 hours, and we were able to complete the print about 4 times over the course of the weekend, which meant we were able to elect 16 winners all weekend. Attendee-goers saw a lot of potential in the print– it featured the logo of one of RoosterTeeth’s most popular shows, and it was large enough to hold change, dice or jewelry. Remember, people attend fan expos with the intention of buying collectibles. If you do some research and find out what the attendees at the expo will be interested in, you will have a line at your booth at 6pm the day the exhibit hall closes full of people who are hoping they will be some of the final people able to get something for free! Predicting that a lot of the expo attendees would be interested in the info, we had Jacob write up a “How-To” blog on his scythe. We pushed the blog on Saturday, the day we were scheduled to have our panel on 3D printing and cosplay, since the two were thematically similar. Every time someone asked a question like “how long did it take to print?” or “how many pieces is it in?” we gave them a business card and directed them to check out the how-to blog. 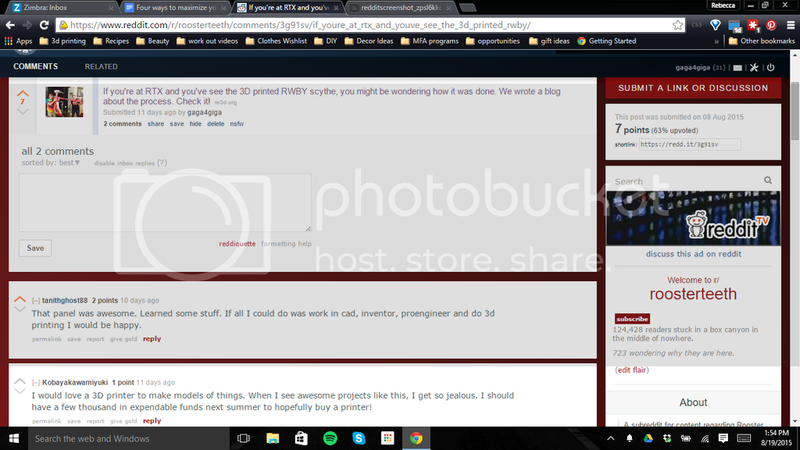 Another thing that really drove traffic was posting a link to the blog on the RoosterTeeth subreddit. I knew that fans were active there, because I had been trolling the subreddit for months in preparation for the event. Also, since a fan has posted Miles’ tweet of our RoosterTeeth office visit, I knew the scythe would be recognizable there. As you can see, the post was not highly upvoted or commented on. This could have been because of the time of day I posted it at, or because I came up with a lousy title. I was bummed by what I perceived as the failure of the post until Samantha checked our google analytics. BOOM! Look at the stats on Jake’s blog (line #3). What’s more, most of the traffic was coming from Reddit. 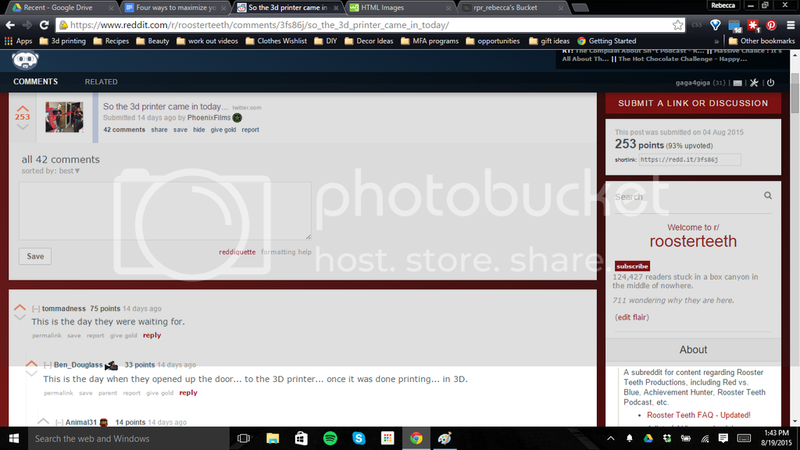 So, unless someone else posted a link to Jake’s blog on some other subreddit (I couldn’t find evidence of this but you never know), it was my post that did it. I learned something interesting that day– it doesn’t matter how someone votes your post on Reddit, they’re still going to click through to your site. I bet that if everyone who clicked through to our blog had also upvoted/downvoted the post, our Reddit post would have faired a lot better than it did! Get your team on the immediate favs and re-tweets! One interesting data point we gathered from working this event was that our tweets faired much better when our team was able to immediately fav and retweet the company tweets from their personal accounts. It seems that Twitter’s algorithm favors content that is IMMEDIATELY interacted with, just as much as content that is showered with likes and retweets through out the day. So, keep your team in the loop with your tweeting schedule so they can back you up from their accounts! That’s really it when it comes to our engagement strategy! We were able to get some photos with RoosterTeeth influencers, but that was mostly luck that no one could take credit for. I’m hoping the re:3D team can repeat and tweak these practices in order to really make every event a home run when it comes to audience engagement. Soon enough, those website hits will turn into Gigabot buys, mark my word! All-in-all, I would say you need to do your research. As soon as you find out where you’re going to be, research the audience, attendees and keynotes. What you find here will help guide all of your choices when it comes to demo pieces, giveaway prints, and event-specific content.